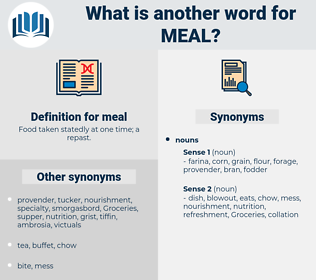 What is another word for meal? Food taken statedly at one time; a repast. bonemeal, soymeal, snack, breakfast, dinner. fishmeal, dish, semolina, dining, feast, menu, cake, flour, banquet, catering, restaurant, meat, cooking, powder, eat, platter, feed, feeds, lunch. Then at ten or eleven, and again at four or five o'clock, they go to the " kitchen" for a square meal. John Wilkes now came in and sat down to the meal. Mauna Loa, ml, malay, mail, meehl, mullah, minimally, meanly, mallee, mulwi, moolah, mammal, male, manual, manly, mammalia, may lily, mamilla, mollah, miele, melee, menial, malaya, mall, mallow, manhole, mule, maleo, molehill, mealy, mol, manila, mellowly, mali, monilia, mellow, milieu, mainly, molly, mill, milo, millay, mulla, maul, mill wheel, molal, monaul, molle, moonily, moil, millwheel, mil, manilla, mole, mull, mulloway, meanwhile, Miaul, mealie, mola, Mele, moll, maillol, monal, mewl, malawi, mollie, melia, memel, mammilla, manul, mile, minimal. feast, matzo meal, nosh-up, snack, brunch, rolled oats, ploughman's lunch, square meal, breakfast, potluck, oatmeal, Indian Meal, tiffin, kibble, dinner, pea flour, banquet, Matzah Meal, picnic, cornmeal, farina, refection, lunch, dejeuner, afternoon tea, collation, buffet, mess, bite, spread, teatime, luncheon, supper, Matzoh Meal, tea, Pinole. 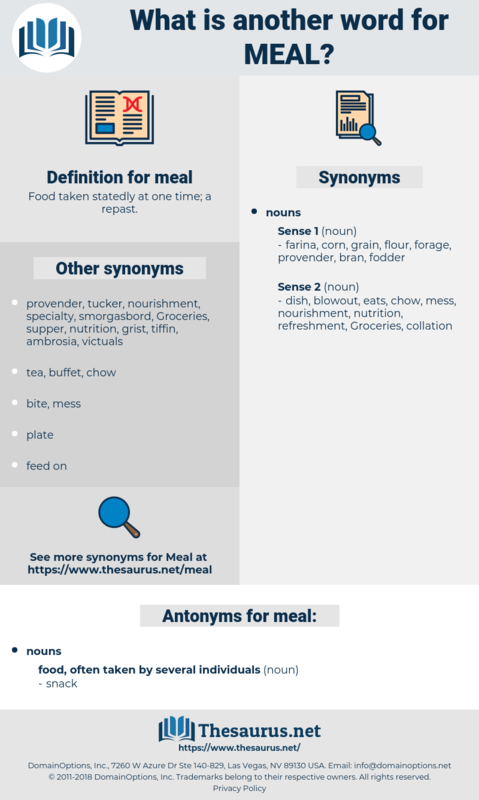 foodstuff, nourishment, food product, sustenance, nutrition, aliment, nutriment, victuals, alimentation. portion, sandwich, helping, Entremets, side dish, course, serving, side order, dish.